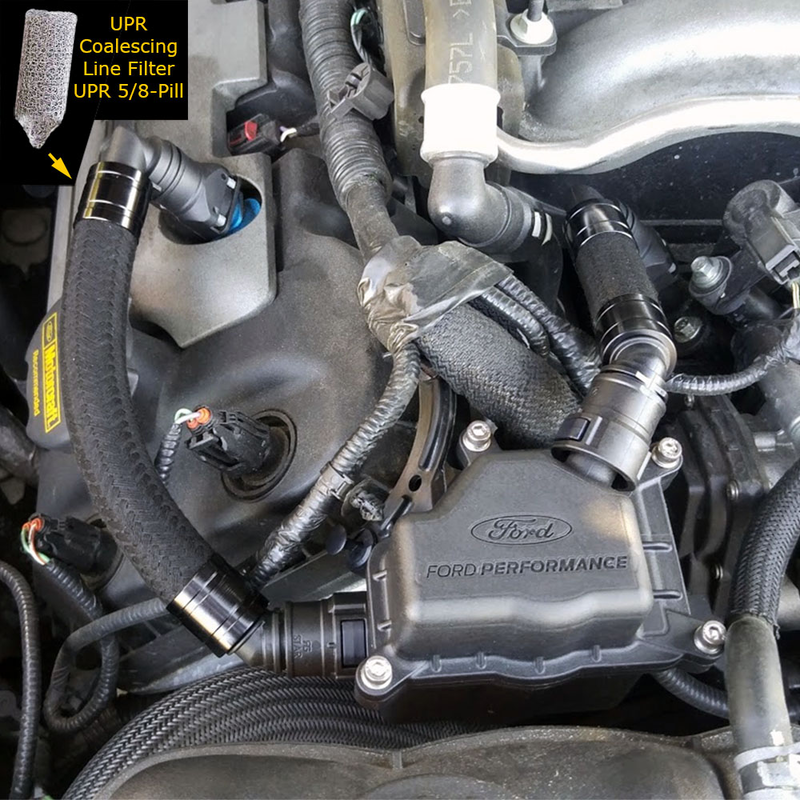 UPR Plug N Play ™ Braided Hose Upgrade with the UPR in line coalescing filter UPR 5/8" Coalescing Pill. UPR Black Billet Hose Ends and UPR Push Button Plug N Play ™ Fittings all the way around. The most significant benefits of the UPR Braided Hose Upgrade is the fact that Braided Hoses run a lot cooler. The paper thin plastic Ford lines have a very slick surface whereas the braided lines have a rougher surface. Running cooler and reducing the slickness of the surface in the lines reduces oil travel and will force the oil to condense much sooner. As these are the two biggest benefits of going to the UPR Braided lines Also, the NEW UPR 5/8" Coalescing Filter that gets installed inline right from the dirty line after the PCV valve forces all the oil exiting the valve cover to start coalescing immediately and reducing the mist and vapor particles. Allowing them to collect and turn into larger more controllable particles. 2011 2012 2013 2014 2015 2016 Ford Mustang GT 5.0 Coyote S197 S550 No one else can stack up to the bold clean styling of our aftermarket Billet dress ups, Street Strip & Racing Suspension & Performance Parts for your late model American Muscle Car!